It was the human rights activist Malcolm X who said the media is the most powerful entity on earth. They have the power to make the innocent guilty and make the guilty innocent and that’s power because they control the minds of the masses. A properly functioning free press is there to speak truth and be the backbone of a well functioning democracy. But what happens when partisan media stops holding power to account? Can it still claim to serve the people or does it become a weapon of mass distraction? Once again the western world finds itself back in a familiar position where the press is parroting one assured narrative, while the public is increasingly sceptical about their claims. So what is really going on? And have we not learned anything from interventions in Iraq, Afghanistan and Libya? Here to discuss the role of the media in support of the Western headlong rush to war is the economist and political analyst Shabbir Razvi and the former army office, detective and counter terrorism intelligence office, Charles Shoebridge. 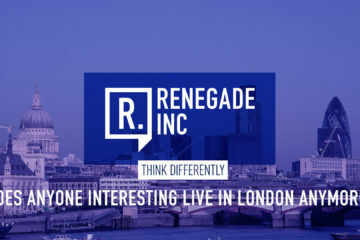 Shabbir Razvi told Renegade Inc. that it would be an understatement to say there is a disconnect with regards to the Salisbury poisoning incident and what is occurring in Syria. “There is no actual reflection of reality with regards to what is happening in that part of the world, whether in Syria or what happened in Salisbury,” he said. “Certainly over the last 20 years, but if you go back historically, even during the First and Second World War, the media was actually an instrument of the establishment narrative. “If you go back and research it, you can see very clearly that the government at that time and their military industrial complex, if there is something they wanted the public to hear and understand, it was done through the media. The media barons historically were of the same clique, coming from the same background, going to the same schools, therefore there was an embedded understanding if you like that the words of our political masters were going to be parroted by the media, and vice versa. In 2018, perhaps due to the internet and social media, it’s not so easy to get the general public to swallow the establishment decree, hook, line and sinker. There is a disconnect, a cognitive dissonance. 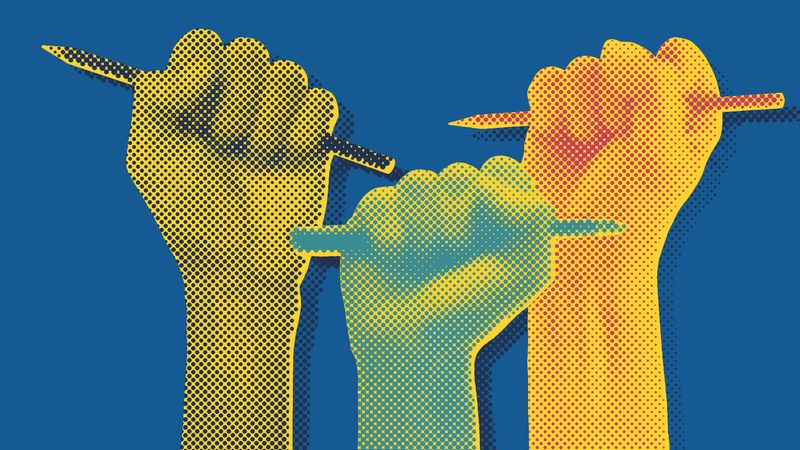 They may still see or read narratives from mainstream media, but intuitively, it’s fair to say that a growing proportion of people are beginning to feel something is different, that there’s something they may be missing. “I would put it down to human beings, human nature because this may be a bit philosophical concept to present but innately human beings are good people,”Razvi says. “Therefore we have this sort of DNA that allows us to understand what is good or bad. 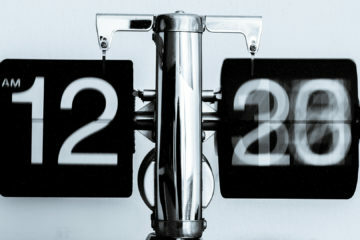 What is evil and what is really not really sort of agreeable with humanity. We pay for shopping in the supermarket. We don’t shoplift because of religion, nothing needs to tell us that it is utterly wrong, so similarly we can see when a lie is being told. “For instance I was at a demonstration in 2003 against the Iraq war when over 2 million people turned up in London. Youngsters, old disabled, black, white, Muslim, non-Muslim. So it was a really a beautiful sort of kaleidoscope of Londoners and people living in the UK who oppose the war and they realised that what Blair was saying was complete baloney. So people have that innate desire to do the right thing, hence they understand when they are being fed lies and therefore they’re able to distinguish it. 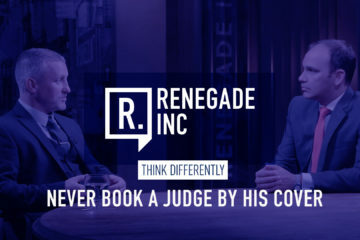 Charles Shoebridge told Renegade Inc. that the general public is more intelligent than the mainstream media give them credit for. 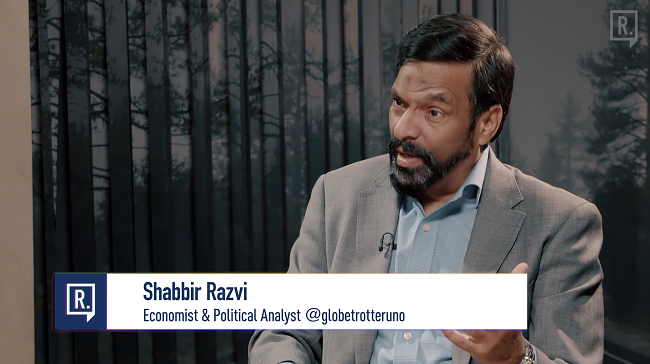 “But I think the aspect about Iraq mentioned by Shabbir is particularly important. I was on that march as well, by the way. It was a beautiful sunny day, I remember it. 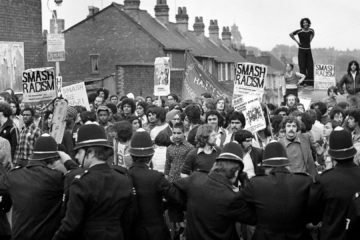 I remember as well that for such a large number of people, I think the official count even was around a million people, it was a massive and extremely peaceful demonstration. There were a tiny number of arrests. Shoebridge says that in the past the media industry has been absolutely embedded in the establishment of the country and its ruling elite. “No matter what party is in power, certainly recently it’s the case that the elite benefits largely from these wars. “The arms industry, the oil industry and so on, it usually benefits the establishment one way or another. The connections that we see between, for example, ruling families, whether it’s the Thatcher family or others with, for example, countries such as Saudi Arabia and so on through arms deals, it shows how the benefits accrue”. That said, in the past, events like wars occurred only once a generation. What we’ve seen recently is a whole range of different foreign policy adventures which have proved to be not what the government and the media told us they would be. “Those adventures from Britain have come very thick and fast over the last 15 years,” says Shoebridge. 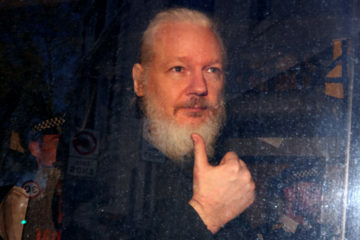 “And so when people say now the government and the those that speak for the government, in our mainstream media, the so-called experts that are constantly on our mainstream media screens, always the same features, often with only dubious qualifications to speak about, but invariably having the uniform qualification of almost invariably supporting the government line, otherwise they wouldn’t be on our media in the first place. “When they say the same thing again-and-again which is that, ‘no we got it wrong in Iraq, but actually you have to trust us now’, for example, regarding the Skripal poisoning, or regarding what’s happening in Syria. Notwithstanding that they also got it wrong in Libya. The mainstream media is losing its authority and is fighting very hard to keep hold of that monopoly position. “Charles’ analysis is 100 percent correct,” says Razvi. Possibly because there are figures behind the scenes panicking, saying the people aren’t buying the hype anymore. However, social media has its dangers. And of course there are bots and trolls out there working on behalf of the British establishment. 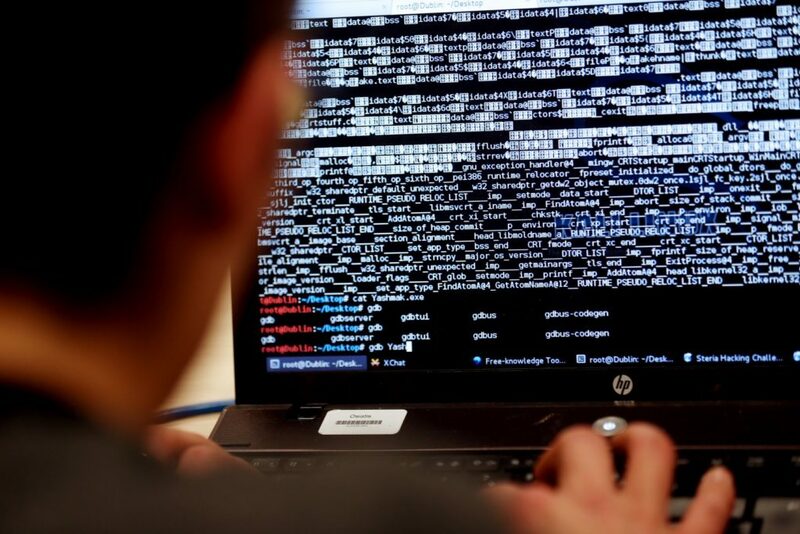 Former UK counter-terrorism officer, Charles Shoebridge says the government is paying soldiers to spread disinformation online. What could go wrong? 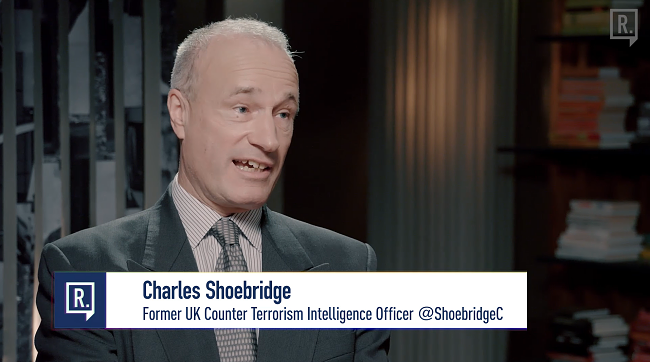 Though he is a former army and counter-terrorism intelligence officer, Charles Shoebridge says he will not be painted by the establishment brush. The British government has been employing hundreds of British soldiers to sit in a room with a computer and a keyboard, tweeting about things that serve the national interest. “Not real soldiers,” he says. “‘Information warriors’, as they’re called, which for somebody who has been a soldier, it’s a very bizarre description indeed. “The truth of the matter is, and again we can go to the government’s own announcements on this, that even though they cloak it as being part of the battle to fight ISIS and online extremism, they have admitted – in fact boasted – that the government is employing hundreds-and-hundreds of trained soldiers, who should be running around fields, carrying weapons and doing some map reading, looking to defend the country, actually to win the government’s battles online, in respect of supposedly, (at least this is the justification), targeting online extremism. The problem is, of course, that as with all governments talking about extremism, no definition of extremism is offered. “Somebody wrote about the BBC and about media generally, that when journalists or tv commentators say, ‘no, I can say what I like’, well of course you can say what you like, because they like what you say. For example the BBC will invite three experts onto a panel to discuss Syria, each with only marginally different perspectives. They don’t, for example, have someone who will ask ‘yeah but did this attack actually take place? Why don’t we actually wait for an investigation? Why don’t we see what the facts are?’ Rather, the confines of the debate are limited to the way in which Britain should intervene. 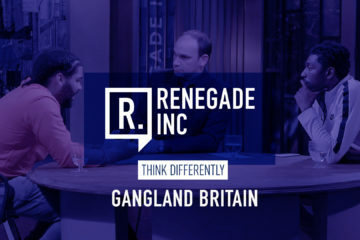 “The BBC will call that a balanced discussion,” Shoebridge says, asking for actual evidence like some kind of a detective. We’re living in a post evidence world. We’re in a fancy politics world now. “When we look at the Skripal situations, the Salisbury case, where people have said, ‘why on earth would the government… and I’ve highlighted it, the government immediately acts without evidence, without an investigation to complete, without the conclusion of that investigation. And now we being asked to believe what’s happening in Syria, for example, the gassing of children supposedly, without, again, any actual investigation. 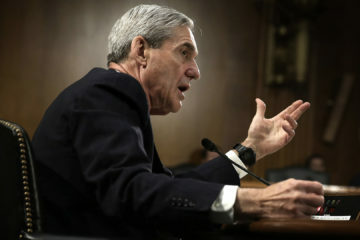 “Well of course people are not going to wait for an investigation, because that investigation may not provide the results that they expect and want. “Therefore if they want to take action, for example, like expelling 23 Russian diplomats, going into a new Cold War with Russia, if they waited for an investigation and let’s say that investigation didn’t produce the results the government wanted and it may not do completely, then it would be too late for the government to act. 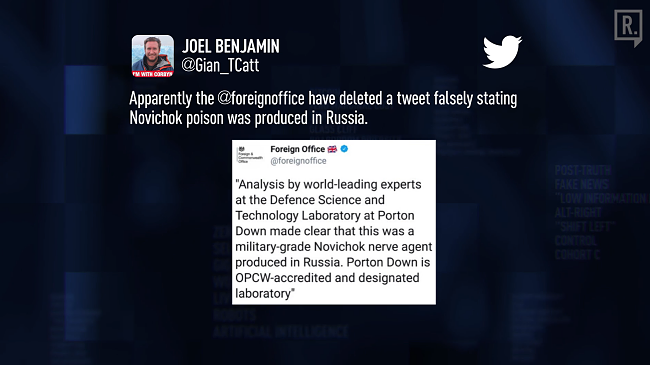 Meanwhile, the Foreign Office apparently deleted a tweet falsely stating that Novichok poison was produced in Russia. Analysis by the world’s leading experts of Defence, Science and Technology Laboratory at Porton Down made clear that this was a nerve agent produced in Russia. Porton Down is OPCW accredited and designated laboratory. Why did they delete that tweet? “Basically, they were saying that Porton Down had confirmed that it wasn’t just Novichock or a similar type agent, but it was from Russia,” Shoebridge said. “So I tweeted at the time saying the Foreign Office or the ambassador in Russia has gone further and claimed it’s actually from Russia, which even the Prime Minister hasn’t said. She said it was very likely to be. Meanwhile, the man who destroyed Iraq, Tony Blair, was given headline coverage to boost his calls for another war. 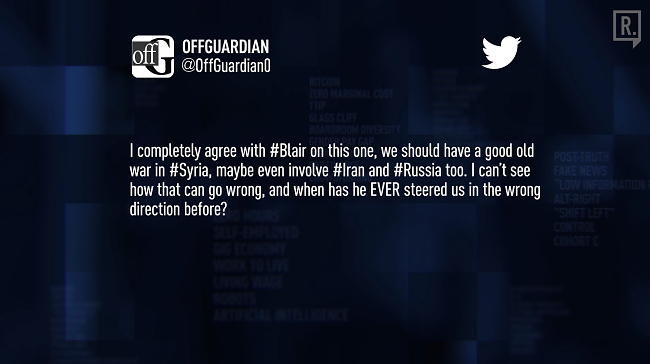 Shabbir describes Blair as “a deeply flawed individual”. Doesn’t want to vote. What is voting even for? Just Democracy. “That’s what a peace envoy is for isn’t it?,” says Shoebridge. Let’s go back to the Iraq war, throughout 2002, the majority of Britons opposed the war, even though most of us knew it was coming regardless of claims from Blair that the likelihood of an invasion was not certain. Then all of a sudden there was ‘evidence’ to support intervention, thanks to a deal struck between Murdoch and Blair. “The Murdoch empire completely put itself behind Blair and went for the war and the opinion polls changed,” Shoebridge says. “Before the war, only a small minority actually wanted it. Now, what’s interesting is that when it came to 2013 and then the alleged Ghouta chemical weapons attack in Syria, again all of the mainstream media went on the offensive. The drumbeat for war started and was absolutely unstoppable. And opinion polls on this occasion showed absolutely the opposite: people did not want us to go to war with Syria. In any case, we’ve had the Salisbury poisoning blamed on Russia, despite the fact it has had 13 years in which to try and take him out and seemingly didn’t bother, and the fact the poisonings occurred eight miles from one of the largest stockpiles of chemical weapons in the world. And now we have reports of Assad using chemical weapons on his own people, just as he is succeeding in reclaiming his country from jihadist rebels. 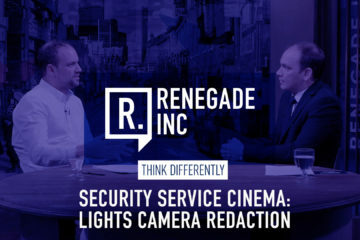 “Quite why Assad would do this against his own people, just as he’s winning, and not even targeting rebels according to the videos,” says Shoebridge. The veracity of those films and video clips have been called into question. 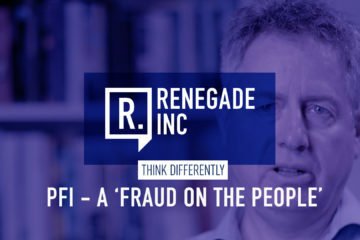 The former army and intelligence officer says we may be at a turning point in terms of people seeing alternatives, but the problems with social media remain. But the point about that divergence is really important. Because the other thing that we should look at, and OffGuardian are very good at this, is how many articles have closed comments when they want to steer opinion. The FT are very good at this. Whenever they report Trump’s next move and anything relating to Syria, they close their comments. This is the divergence. This is the problem, coming back to the point about the mainstream media losing its grip. Is that a hopeful situation? “It’s not only hopeful, I think it’s also allowing people through social media also to get a perspective from different parts of the world, not just from UK,” Shabbir says. “Someone could be sitting anywhere on this planet and would be connected with social media and sort of having a perspective on what is happening in the UK. So you can’ just cordon off information like it was possible even 50 years ago. So that is obviously a very very good sign. 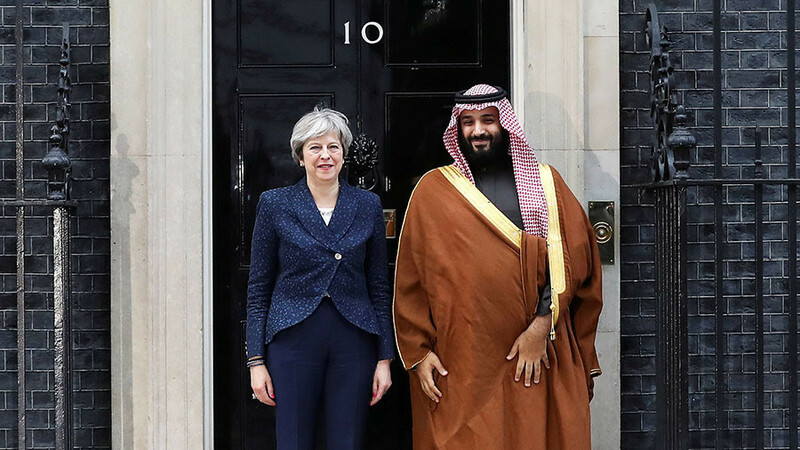 It is of course a total coincidence that the raids on Syria took place just days after Saudi Prince Mohammed bin Salman paid a visit to Number 10. When Sergei Skripal was poisoned, around 24 countries towed the British line, publicly blamed Russia and expelled its diplomats. “Russia may be responsible. It’s just that we don’t have any evidence to support that at the moment,” says Razvi . “But you’ve got a situation where, for example, you see headlines in virtually all the British media: ‘world unites against Russia’ or ‘world backs UK’. “And when you looking at social media, you see actually, no this person and this newspaper in India is not supporting this, and this China News Agency, perhaps unsurprisingly, are not supporting it either. “Then you realise: ‘oh hang on has there’s 193 countries in the world and because 20 of them have backed the UK, it’s ‘world backs UK’. “The world for the Western media means basically the West, and again, only a small part of the West,” says Shoebridge. 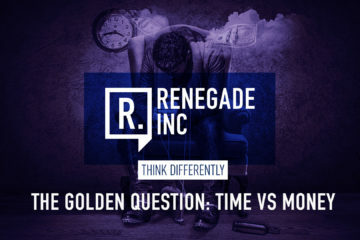 Razvi told Renegade Inc. that the current state of international affairs is connected to the 2008 financial crisis which the world still has not recovered from. 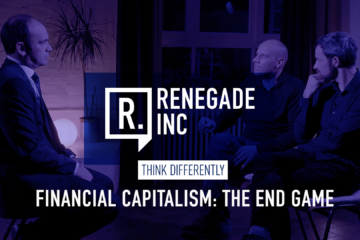 “What I think is happening, in truth, is that especially with the crisis taking place in Syria and the Middle East and also the economic crisis that really we haven’t come out of financially, we’ve been tinkering, we’ve been creating elusive money by giving more credit to the national banks,” he says. Propping up the insolvent is an elegant way of saying it. 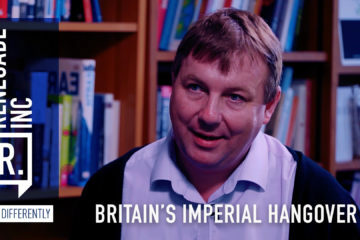 “So in that way, whenever that happens, the countries actually create an external enemy, even in a small level, like what happened during the Falklands crisis under Margaret Thatcher: Britain had a economic crisis at that time. “Thatcher created that Falkland illusion that we were fighting a war, her ratings increased and she wins the second election in a thumping manner. That happens all the time where external enemies are created when you have huge problems internally, and we do have social problems. We’ve got you know economic problems, we’ve got housing, health care, just in our own country, and Brexit. Brexit is not doing very well either. Theresa May has taken something straight out of the Thatcher playbook. Let’s go and create a bigger crisis somewhere else. Why? Because she can’t deliver on all the things at home. Ultimate diversion. But is she going to pull it off? “The opinion polls have shown and don’t forget we’ve got elections coming up in the United Kingdom very soon, that will be a litmus test for this government’s performance and popularity,” says Shoebridge. “Just before this Skripal incident took place, May was doing appallingly badly. Since then, with this torrent of propaganda coming from the mainstream media, not a single one of these newspapers and television programs are really putting in any decent questioning of the evidence or even questioning the many inconsistencies of the government’s line and have praised her so-called strong action against Russia. It’s amazing that this is where we’re at. “As far as the establishment is concerned their model is working very successfully, thank you very much” he says. “We are still in power. No one has really dislodged us. So they, we, continue with the same prescription, with the same manner in which they present the facts as they are. “Of course the population, the general public are quite not really in congress with the establishment, therefore there is some challenge going on. But then the huge problem that everyone in the West is facing is the economic challenge, what is known as ‘debt slavery’ in economics. That, I think, quietens people down when they want to really challenge the system. Has this trick been used one too many times? Where from here? Shoebridge says that as a population we’ve been lied to. “There’s a lot of evidence of fall out, but absolutely indisputably, we have been given completely false information and a false narrative over a number of foreign policy issues which were then used to justify British and American actions. “Libya, Syria. The destruction of Iraq. These cannot be repeated mistakes. “People who work in the foreign office in Britain, in MI6. They are not stupid people. They are not making mistakes. The first time you can say. ‘Okay we misjudged that, we didn’t know the intelligence, we made a mistake’. We keep apparently backing the wrong horse. “So then you have to look at it from a slightly alternative perspective and say, ‘perhaps we didn’t back the wrong horse perhaps actually we backed the right horse,’ depending on what ‘right’ means. In other words, depending upon what the actual intention and aim of that policy was in the first place. “So if actually, let’s say for example, your intention, as foreign policy objective, wasn’t to install democracy in these countries as was told at the time, wasn’t to look for WMD, wasn’t to stop terrorism but was actually to destroy those countries. Funny enough three countries, Syria, Libya, Iraq that were implacably opposed to Israel for example and therefore opposed by the United States. If that was the objective to destroy and destabilise those countries. The foreign policy has been extremely successful. 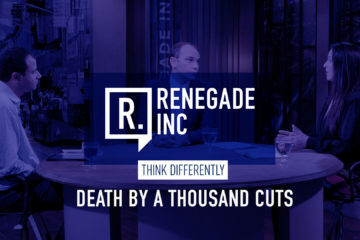 Join us next week for more insight from those people who are thinking differently but until then. Stay curious. 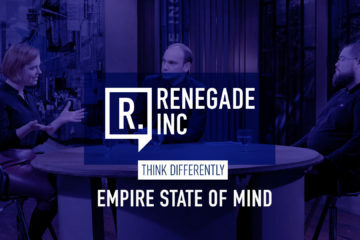 Renegade Inc. is a new mainstream media platform which creates and broadcasts content aimed at those who think differently.Its mission is to inform, illuminate and inspire, focusing initially on three sectors: entrepreneurship, self-learning and the arts. Democrats Issue Lawsuit Vs. Russia, Trump – Oh My! It speaks volumes about the limitations of our democracy that a small group of academics and journalists are being attacked by the BBC and Times, simply for doing their job. Do their respective smear campaigns show us the limits of what we are now allowed to question?